After years observing elephants in the wild, filmmaker Martyn Colbeck has learned how vast — and how mysterious — the realm of elephant communication is. Elephants rely on a complex communication system to sustain their clan-based society. At the root of it is a common language. Long-lived and large-brained, elephants are not only capable of expressing complex thoughts using this common language of intricate acoustics, they have a great deal of social and ecological knowledge to share. Elephants have a wide range of calls and signals for different purposes — to secure their defense, warn others of danger, coordinate group movements, reconcile differences, attract mates, reinforce family bonds, and announce their needs and desires. Researchers like Joyce Poole have been trying to crack the code of the elephant communication for years. Poole has found that the elephants use more than 70 kinds of vocal sounds and 160 different visual and tactile signals, expressions, and gestures in their day-to-day interactions. Vocal calls are likely the most common way elephants confer. Calls are used for everything from caring for calves, reconciling differences during disagreements and coordinating the group’s next move. At the end of a meal, when it’s time to move on, one member of a family moves to the edge of the group, typically lifts one leg and flaps her ears. She repeats a “let’s go” rumble, which eventually rouses the whole family, who then hit the road. An elephant can recognize the calls of hundreds of other elephants from a half-mile away. That famous shrill trumpet call is the one we most often associate with elephants but the creatures can also squeal, cry, scream, roar, snort, rumble, and groan to get their point across. Whatever form the call takes, it can be soft, abrasive, low-pitched or shrilling. There’s even a place for jackhammer-like ear splitting blasts as a danger or alarm call to signal others to form a protective circle around the younger members of the family group. But of the motley assortment of calls in the elephant repertoire, deep growling or rumbling noises are, by far, the most common. Some researchers even postulate that each individual has its signature growl. A recent discovery is that much of elephant language exists in a range that humans can’t even hear. The deepest sounds we can hear, the grunts or rumbles, are the mild overtones of low frequency sound from 1 and 20 Hz, which is below the level of human hearing. Such sounds are so low and powerful they travel unhampered for miles through forest, allowing elephants to send messages and warnings over long distances. These powerful, distant-traveling sounds are critical in helping males find females for breeding. 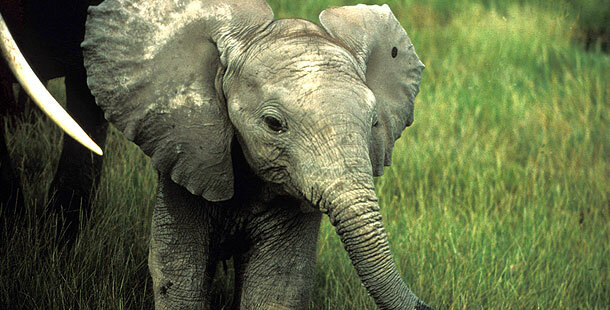 Researchers say the infrasonic calls also enable elephants to reunite with friends and family members. One rumble means “Hello, I’m here,” another “Help, I’m lost” — important messages for helping separated family groups find each other. Breeding herds also use low-frequency vocalizations to warn of predators. Adult bulls and cows have no enemies, except for humans, but young elephants are susceptible to attacks by lions and hyenas. When a predator appears, older members of the herd emit intense warning calls that prompt the rest of the herd to clump together for protection and then, if necessary, flee the scene. One call researchers have just deciphered is the “contact call.” This call helps elephants locate distant family members. The elephant seeking to make contact lets out a powerful reverberating sound, after which it lifts its head to listen for a response. If it receives one, it emits an explosive sound. The pattern is repeated, possibly for hours, until the elephant successfully rejoins her family. Any reunion of elephants is met with an exuberant greeting. The greeting ceremony, as it’s called, is marked by trumpeting, screaming and rumbling. Because males and females dwell in separate social worlds, different methods of communication exist for both. Researchers have found that females have the most extensive vocal repertoire. Seventy percent of all known calls are made by adult females, juveniles and calves, leaving only thirty percent for adult males. Vocalizations are essential for the mating ritual. Males, with their solitary life, rely on calls to announce their sexual state, identity and rank. A bull in musth (or in breeding state) signals that he desires sexual activity by displaying specific courtship behavior, which includes the emission of scent, discharge of bodily fluids and broadcasting of infrasound calls. Such low, powerful calls carry more than 2 miles in the air. The infrasound call signals to other bulls to keep away, as bulls in musth are aggressive and dangerous. The cow has her own set of mating behaviors and calls. A female can broadcast her receptive state to bulls miles away, also through infrasound calls. After mating, the female rumbles out the post-copulatory sequence, a group of six grunts with strong overtones. She repeats this sequence several times, continuing for up to half an hour. Touching, caressing and smelling each other with their trunks also helps elephants maintain their social bonds. Tactile sensations are very important to communication in elephant society. Trunks are essential to their tactile sense. They use their trunks to caress each other or explore other objects. For instance, elephants communicate their interest in death when they touch and smell bones of dead elephants with their trunks. Members of groups passing one another in the brush will pause to exchange touches, while courting bulls will intertwine their trunks with the trunks of cows. Researchers have found that elephants also appear to communicate by sensing seismic vibrations through the soft skin on the pads of their feet. Elephants may also lay their trunks on the ground to detect vibrations in the earth. One distinct behavior of elephants in the wild is synchronized freezing. Remaining motionless helps elephants focus their keen senses of smell and hearing on unfamiliar noises and odors in the air. Smell is their most developed sense. With their long trunks, elephants can keep track of odors on the ground as they walk head up, and they routinely touch and smell each other’s bodies with their trunks. Elephants rely on their varied and sophisticated means of communication not only to orient themselves properly in the world, but also to recognize, honor and somehow carry on the world of the past. Understanding how elephants exchange information and what they seek to express teaches us so much about their fascinating world.